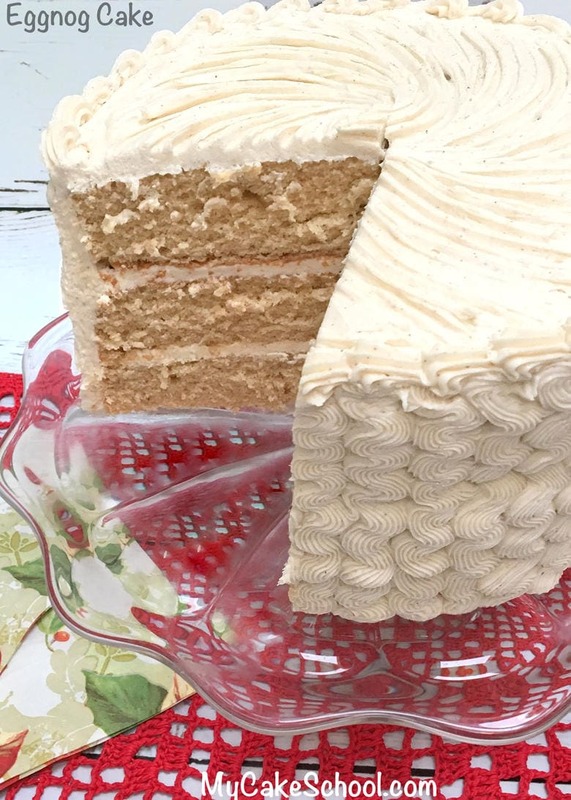 Today we are sharing a delicious scratch recipe for Eggnog cake with Eggnog Buttercream Frosting! This old fashioned favorite is moist, has a lovely soft texture, but is still firm enough to hold up to fondant and versatile enough for cupcakes! Another reason to love this flavorful Eggnog Cake recipe is that it makes a generous amount of batter for three cake layers. Once baked & assembled, the cake has a great height to it, and is filled with wonderful spiced goodness. I have to say that it took me YEARS to finally try Eggnog Cake. Just the sound of it (and the idea of eggnog in general) didn’t appeal to me. Well, I couldn’t have been more wrong. This is now one of my FAVORITE cakes to make for the holidays. It’s just so cozy. (Can cake be cozy?). I think it can, and it is. 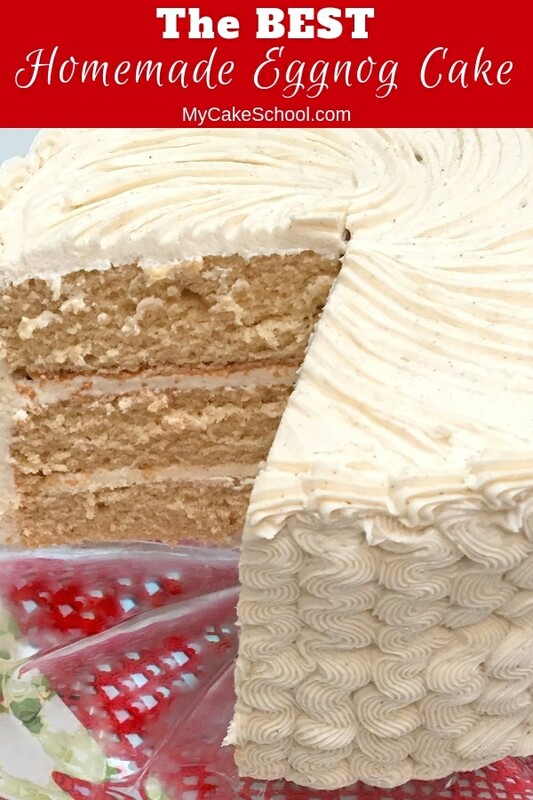 The Eggnog Buttercream is simple and amazing too! I don’t even think the cake in the photo lasted 24 hours…we devoured it. If you’re looking for the perfect festive dessert for the holidays, this is it! 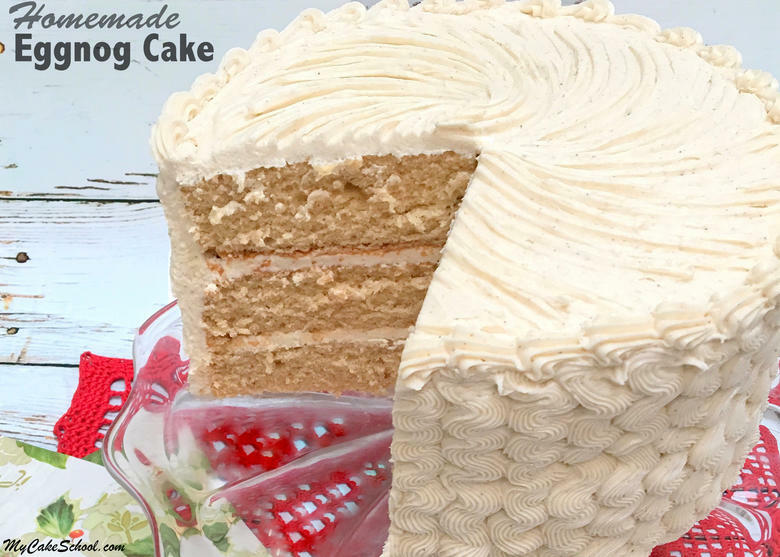 If you prefer working with cake mixes or if you like to keep great doctored cake mix recipes on hand for a super quick and easy dessert, you’ve got to try our Eggnog Cake (doctored cake mix) Recipe! *Preheat oven to 350. Grease & flour three 8 inch pans. 2 sticks (226g) unsalted butter, softened. Do not soften in microwave. Cut the sticks of butter into 1/2 to 1 inch slices, it will be added a few pieces at a time to the dry mixture. In the bowl of your mixer add the flour, baking powder, salt, sugar, cinnamon and nutmeg. Mix on low speed as you gradually add the pieces of butter. Mix until the dry ingredients are crumbly and moistened by the butter. There should be no dry looking flour in the bowl. Scrape sides and bottom of bowl. Add 1/2 of the egg mixture and beat on medium speed for 1 1/2 minutes, scrape the bottom and sides of the bowl. Add the remaining egg mixture in 2 additions, mixing at medium speed for 20 seconds after each addition. Scrape the bottom and sides of the bowl and pour into baking pans. Bake at 350 degrees for 25 to 30 minutes or until a toothpick comes out clean or with just a few crumbs attached. Cream the softened butter until smooth. Blend in vanilla, nutmeg, cinnamon and salt. Add 1/2 of the powdered sugar and most of the eggnog. Beat at medium speed until the powered sugar is incorporated. Add the remaining powered sugar and eggnog and mix at medium speed another 3 to 4 minutes scraping the bottom and sides of the bowl occasionally. I slow down the mixer to very slow (#2 on the Kitchenaid) for 1 to 2 minutes. This will help eliminate air pockets in the buttercream. The recipe and be doubled or halved. Can be frozen in an airtight container for at least 3 months, thaw on the countertop and remix. This is a crusting buttercream and will work well with the Viva Paper Towel smoothing method. Very high humidity may cause it to crust less, in that case you can use the hot knife method for smoothing. 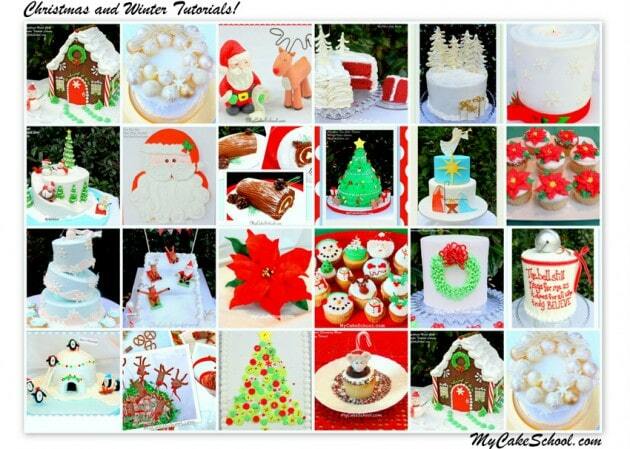 If you’re searching for more ideas for Christmas and winter cake recipes and cake decorating ideas, don’t miss our full Roundup of Christmas and Winter Cakes! Thanks for stopping by! Don’t miss our full collection of tried and true cake, cupcake, and frosting recipes in our Recipes Section! Happy Baking! Great cake, turned out perfect. I used a cinnamon Swiss meringue buttercream. It looks divine, Zoe, and cinnamon SMBC is a perfect choice. Thanks so much for posting a picture! This was delicious. For anyone curious, the recipe makes about 29 cupcakes using a wilton standard cupcake scoop to fill the cups. There’s actually a little batter left at that point, but not enough for a full cupcake, so next time I’d add a little bit of batter to each cupcake after the initial filling. They took about 21 minutes to bake. Hi JadesRevenge, Thanks so much for posting the information on cupcakes, very helpful. We are happy to like the recipe! Would really love to try this cake, but for some reason the reverse creaming never works for me. Is it possible for me to mix it the conventional way? Hi Sara, Yes, you can definitely make any of the reverse creaming recipes using the conventional way. I suggest using one of your conventional recipes as a guide, rewrite the recipe into the conventional method. You are less likely to make a mistake if you rewrite the recipe. Be sure to count the ingredients to make sure you have not left out one. I think the only question you might have is when to add the vegetable oil……combine it with the eggnog to add alternately to the dry ingredients. Let me know if you have other questions. Made the cake layers and they look delicious and smell delicious. I always have domes cakes though. What could be the cause of this. Hi Patrice, I think that could be done but we have not tried it so I am not sure how much rum to add for the flavor to come through. I think you could replace some of the milk with rum, maybe 1/4 cup. You could also add a teaspoon of rum extract in place of one of the teaspoons of vanilla (Wal-Mart carries rum extract) Hope all goes well, let me know what you think if you give it a try. Hi, I would like to make this cake for a gathering, but I only have two 8″ cake pans. Can I keep some batter in the bowl while two layers are baking, then reuse one cake pan to bake the 3rd layer? I wonder if the batter would keep well after it’s made. Thanks! Hi Qing, The third layer may not rise quite as high, but this is your only option so I would give it a try. I have done so with success but have not tried using this recipe. Refrigerate the batter while the first two pans are baking. Let me know how it goes. Hi, I did make the 3 layer cake with 2 8″ pans. I followed your recommendation and kept the batter for the 3rd layer in the fridge while the first 2 layers baked. But I brought it back close to room temperature before baking. Indeed it didn’t rise as much as the first 2 layers but the difference is not very big. The cake was delicious. I did make quite a few changes. I always cut the sugar and oil/butter down. That’s just me. ☺ Thank you!